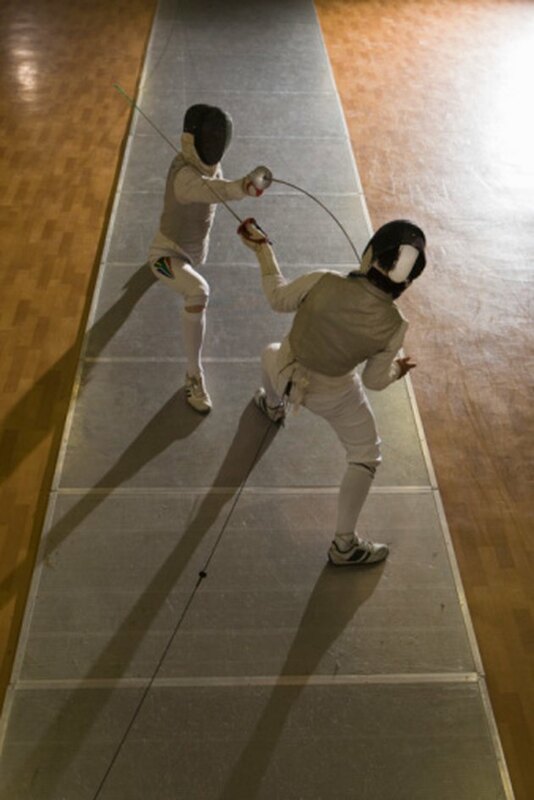 Fencing is a potent mix of swordplay, athleticism and tactical maneuvering. In order to unlock your opponent’s defenses, you will need a repertoire of moves at your disposal. By combining these moves, you will be able to manipulate your adversary and create space in which to register a touch on your opponent. The lunge is a standard but highly effective attacking movement. From the basic fencing position, extend your right foot forward as far as possible without overstretching or losing balance. As you lunge towards your opponent, extend your sword arm and engage your opponent with a stab or slash. The passata sotto is an evasive movement with a twist. Evade your opponent’s attack by dropping your body beneath his or her weapon, placing your free hand on the ground for support and balance. As your opponent looms over you, straighten your sword arm and attempt to stab your adversary. A parry is a defensive move aimed at blocking or deflecting an opponent’s attack with your blade. The basic parry is further divided into subcategories, each referring to specific directional movements of your sword. You would use the “parry of four”, for example, to block an attack aimed at your right side and the “parry of six” to block an attack aimed at the left side of your body. A counter-attack is an attack made in direct response to your opponent’s attack. In short, it is an attack into an attack, says the Amarillo Competitive Fencing Association website. The riposte is another form of counter-attack. Unlike the standard counter-attack, a riposte follows a successful parry of your opponent’s attack rather than a direct launch into the attack. A remise is a short series of attacks. You do not withdraw your weapon arm between attacks in the series. A beat is similar to a speculative jab in boxing. By using your blade to strike your opponent’s blade, you can create an opening or perhaps provoke your opponent into an unplanned or hasty reaction. You can use feints to deceive your opponent. The idea is to trick an opponent by launching one or more fake attacks with the intention of creating a gap in their defenses. According to Berndt Barth and Emil Beck in “The Complete Guide to Fencing," you can carry out feints from varying distances and with many different footwork combinations. For tactical fencers, the second intention is a cunning way to open up an opponent’s defenses. It is similar to the feint, but you design your entire move with a second strike firmly in mind. Your first attack is a feint that your opponent will parry. After the parry, your opponent launches a riposte that you then parry before launching a premeditated counter-attack. If you control the entire engagement correctly, you will open up a clear striking opportunity.